High-speed mixing is a technique rapidly increasing in popularity in the baking industry. 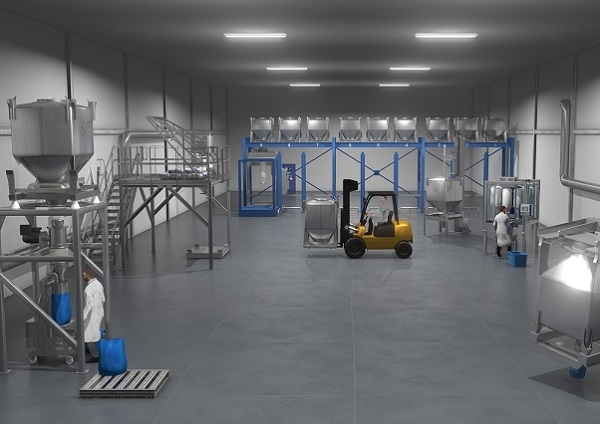 Speed is the key to a number of fundamental advantages which lead to consistent high quality and low production costs in high-output plant bakeries. New technology introduced at the IBA exhibition in Germany in September 2018 expands the market for the high-speed mixing process, which can now be used in hot climates—including all Asian countries—where effective dough temperature control has commonly been a problem. The new process combines radically enhanced bowl cooling with advanced control technology to provide precise management of dough temperature in any climate. Bakers located in any environment can now benefit from a high-speed process. The new system, which can be retrofitted to existing installed Tweedy mixers, features a re-designed cooling system that can significantly increase heat transfer from the dough to the cooling jacket during mixing. Specialist software measures flour and ambient temperature and relates them to energy requirements for the mixing process. It then regulates incoming water temperature and applies jacket cooling to achieve the exact dough temperature required. This creates complete control over dough temperature, which is fundamental to efficient downstream handling. The target temperature for dough is normally 26 to 30 deg C.
Mixer bowl cooling is very cost-effective compared to the capital and energy costs of flour cooling equipment and bakery air conditioning. These costs have prevented many bakeries in hot climates from taking advantage of high-speed mixing. The ability to closely control final dough temperature regardless of variations in ingredient temperatures and energy levels is a major improvement on the standard high-speed process. Although bowl cooling has always been an option, it has not been sufficient to avoid measures such as adding ice to the mixing bowl when ambient temperatures are high. The new cooling technology is designed for high-output plant bakeries making tin and pan bread, including white, brown, wholemeal, multigrain and mixed rye loaves. Burger buns, rolls, and pizza bases, can also be produced. High-speed mixing is achieved in a completely integrated system in which ingredient weighing, mixing and dough development takes place rapidly and seamlessly. A batch of dough is typically mixed and developed in three minutes. While one batch is mixing, another is being weighed out. The process is the same as in conventional mixers—just much quicker. 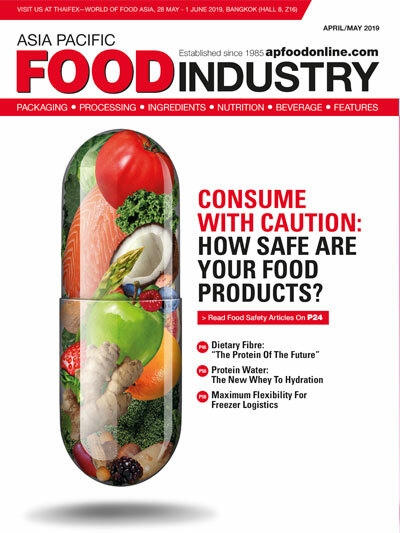 Short mixing cycles and automated ingredient feeds give a decisive advantage. Because the mixing process is rapid and batch sizes small for a given output, each batch is processed through a divider and moulder before significant fermentation (or “gassing up”) can begin. This helps to achieve accurate weight control and consistent texture as well as easier handling through the forming processes without the waste, giveaway and downtime caused by dough gassing. The design of the bowl and mixing tool—plus the speed of rotation—combine to produce a 3D mixing action that stretches and shears more of the dough for more of the time. The result is rapid structural development, allowing up to 12 batches every hour. 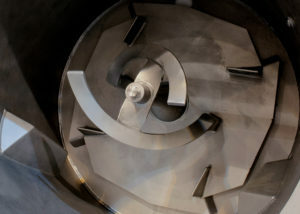 A combination of high-speed mixing tool and baffles on the periphery of the mixing bowl simultaneously work a very high percentage of gluten molecules in the dough during the dough development stage of the process. The consequence is that the high-speed mixer can produce good quality dough with lower quality flour because mixing is much more thorough. 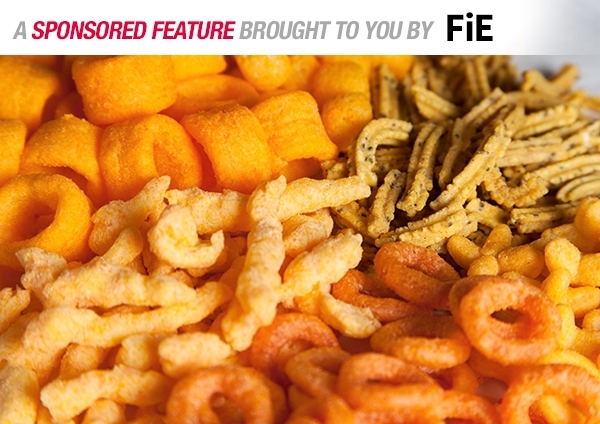 This creates the potential to either use flour with lower protein content or reduce/eliminate additions of vital wheat gluten—both meaningful cost savings. Achieving comprehensive development in the mixer involves the use of pressure and/or vacuum sequentially in the mixing cycle. By pressurising the bowl in the first mixing phase, more air is added, providing oxygen to enhance the action of ascorbic acid. This improves development and gas retention in the dough. Vacuum in the latter stages helps create very precise control over the size of bubbles in the dough to refine the crumb structure of the finished product. The proportion of pressure and vacuum applied determines whether the dough texture is fine—for bagels, for example, or open, such as baguettes. As these proportions are simply altered, it’s easy to switch to a different product. A range of textures can be generated, from close-grained pan bread to open artisan-style loaves and everything in between, making the high-speed process ideal for many products beyond tin bread at high outputs for which it was originally conceived. Rapid product changeover is a benefit to every baker, particularly where a variety of products are needed each day. The high-speed mixer was originally conceived to meet the demands of high-output bakeries for product consistency, high efficiency and low levels of operator input. Until now, it has been mainly bakers of tin or pan bread that have benefited: bakers of other products have been reluctant to embrace high-speed mixing because they believed that either their output did not warrant it, or that the end product would be different. 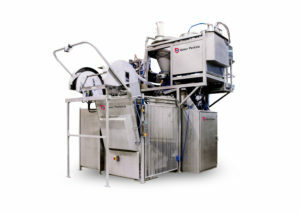 However, several integral features combine to make the high-speed mixing process ideal for many other products, with a range of machines covering lower and medium outputs. 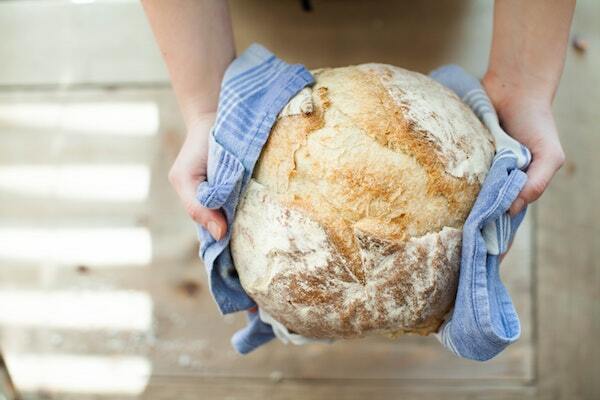 Baguettes, focaccia, ciabatta, batter, rye, soda, pita and artisan breads, brioche, breadcrumbs and Panko, bagels, cinnamon rolls and burger buns—including the use of the sour dough, liquid sponge and sponge and dough processes—are all possible. The scope is still being extended. The high-speed mixing process is fully automated with advanced control software. There is a clear and informative touchscreen human-machine interface, with process visualisation to let users know what is happening at every point at any time. Well-structured software and industry-standard hardware are reliable and supported worldwide. Control features include automatic management and adjustment of both recipes and scheduling, even after stops. Recipes may be stored locally or downloaded from a higher-level system. Changes are implemented without delay at the next batch. The dynamic scheduling system monitors dough use and will programme one or a pair of mixers to provide a constant feed of dough without long resting periods, and without gaps in supply. There is a comprehensive reporting system with excellent connectivity to external systems. Fault finding is made easier by alarm filtering that displays only primary alarms so that operators can trace the source of problems without being side-tracked by downstream alarms. 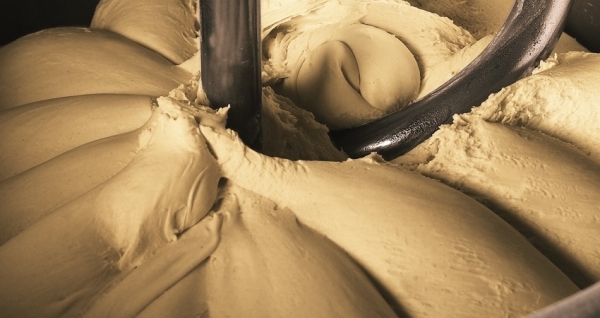 Process alarms alert operators to potential parameter variations that might affect the dough. Hygiene has been a design imperative, with fast cleaning times and simple maintenance. A wash attachment for the beater plus a self-clearing drain valve provide a quick and effective method of cleaning the bowl and lid. The ingredient platform and top of the lid have been designed to minimize the accumulation of debris and make any that does collect very easy to remove. Liquids on the ingredient platform are contained by a fully drained wash-down wet area. A time-saving automatic washout system developed for the mixing bowl gives a really effective cleaning action and eliminates operator involvement. The latest development is the introduction of two machines for test and laboratory applications, with maximum batch capacities of 8 and 20 kg respectively. As well as ensuring the process replicates a bakery’s existing product range, they are used by ingredient suppliers working on new formulations to improve high-speed mixing, and research organisations studying high speed mixing and other aspects of the bread making process.